Aaron Seton continued his series dominance by taking pole position and two race wins on the opening day of action at Round 2 of the TA2 Muscle Car Series at Morgan Park today. Seton’s Harris Racing Mustang time of 1.15.6 was over a second clear of George Miedecke with Russell Wright’s Mustang in third. Reigning champ Ashley Jarvis was fourth ahead of 16 year old Nathan Herne, with Michael Kulig’s fully rebuilt Camaro and Drew Ridge’s Mustang making the Top 10. Seton came under pressure early in Race 1 from Miedecke, however the safety car was called after Warren Wadley spun at Turn 12 and wouldn’t fire up. On the restart, Seton gapped the field and was never headed. Herne and Ridge had a great race, going side by side through Turn 6 with the Dodge Challenger racer hanging on to finish strongly. “We tested here last week and the Castrol Harris Mustang is really in the zone today,” Seton explained. Race 2 was marred by a massive crash involving Mustang driver Tim Tritton, when his car stepped out under the bridge at Turn 3 and slammed hard into the outside tyre wall. Tritton wasn’t hurt, although the car was seriously damaged. A safety car was deployed while officials cleaned up the mess, which left a three-lap sprint to the flag. “I’m ok, just a bit bruised and not sure what happened, but the car just stepped out on me over the hill,” said Tritton. 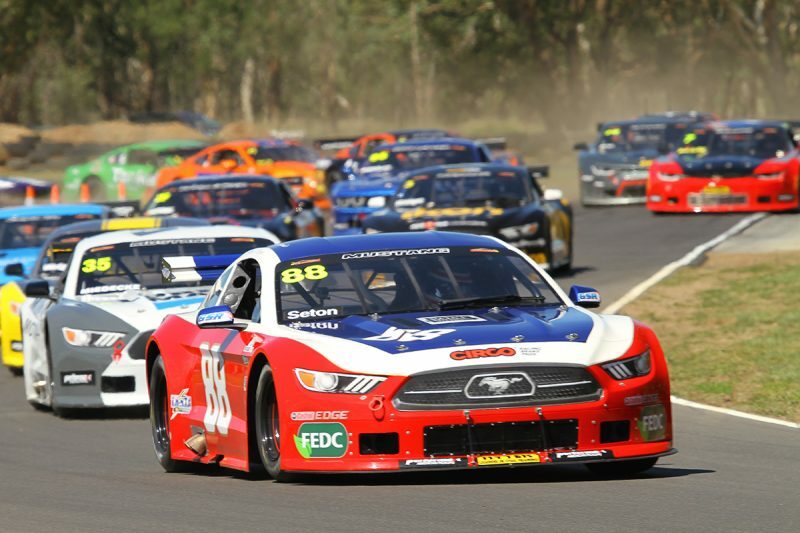 Front-runner Drew Ridge in the Ikon Signs Mustang suffered an alternator failure while under safety car and stopped on track, and Anthony Tenkate’s Mustang spun at Turn 6 on the final laps and failed to finish due to a flat tyre. Cam Sendall had a strong run to 11th while newcomer Christopher Formosa in the Dukes of Hazzard General Lee lookalike claimed a respectable 14th in his first TA2 run. Race 3 and 4 will be live streamed tomorrow via the AMRS Website and Blend Line TV.